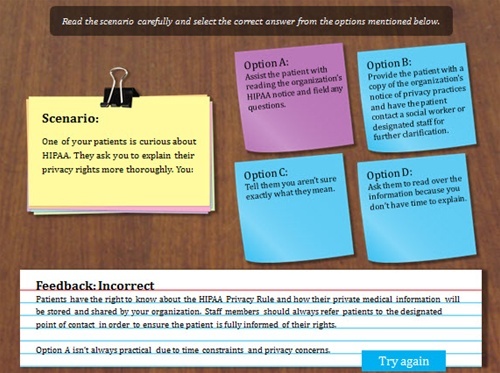 Break away from a boring form based quiz layout with this notecard, sticky-note, desktop interaction. This Storyline template is much more interactive that your typical eLearning template; the learner reads the scenario on the notecard, selects from several options on the sticky-notes, and then gets custom feedback by choice. It is also fully customizable. Rather than just providing you with a single finished image, this template includes independent assets (notecards, sticky-notes, etc) that can be moved or modified. It features many of the elements available in the note and paper image bundle. If you liked this Articulate Storyline template, you might also like the Storyline corkboard template because it has a similar design.